We currently have two different options with advertising space available. You can see the pictures below to get an idea of what they look like. You just decide which size works best for your needs and your budget and we take care of the rest. Trucks/trailers are fitted with new curtains that are fully branded with state-of-the-art graphics. Advertising with East Coast Freight Distribution offers exceptionally high visibility, mobility and reach. Keep your brand top of mind! The semi-trailers above allow for a massive 40' (13.2 metre) display for your branding. Trailers travel throughout Brisbane, the Sunshine Coast and Gympie. 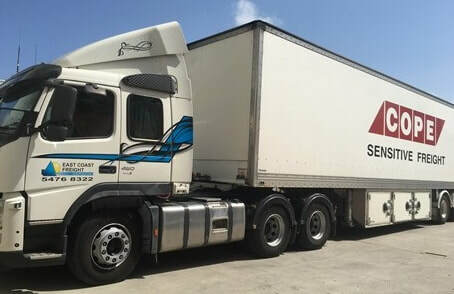 Rigid trucks travel around the Sunshine Coast going as far north as Gympie and as far south as Brisbane.